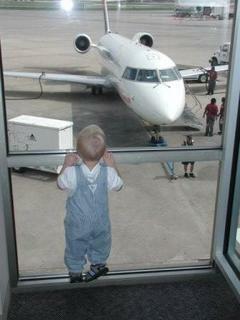 says bye bye and blows kisses, laughs with his whole being (as you well know). And he is very good with other kids. He’s even learning to share. For instance, this morning I walked with him over to a local bakery that has a cafe on the main road very close to here, and was happy to learn they have a whole playground for children. It’s really excellent, with a sandbox, jungle jim, a wooden train, a seesaw. At one point, a little girl went over and picked up some trucks that Ian had taken out of the sandbox and then left behind. As soon as she started playing with them, however he ran over and pulled them out of her hands. I said to him, “Ian give her one truck and you can keep the other.” Without hesitating, he gave her one. She hissed at him, but Ian was already off exploring something else, truck in hand. On the down side, his sleeping is still not as I would wish. He fought his nap today, and finally I just let him get up without it. Beata’s mom had invited us for obiad (the big meal in the middle of the day), but then Ian fell asleep in the stroller on the way there. He managed to sleep about a 1/2 hour, but of course was more fussy than usual for the rest of the afternoon. Tonight, he fell asleep within about 40 minutes (the fastest yet since coming here) but was crying at the top of his lungs for at least 10 minutes. By then, he was completely exhausted and finally fell asleep. I’m still looking for a babysitter, but have a couple of leads. Nothing is sure, and nothing seems ideal, but hopefully it’ll workout. Otherwise, it will take some creativity to get my work done. More than anything, I long for the reliability and security of a caregiver I can count on and who takes good care of Ian. Even with these challenges, though, I’ve already done some good work and had some interesting interviews. One thing that really seems clear is how much the Bieszczady region relies on work abroad. So many young people have left, especially the villages. And in Lesko, whole neighborhoods have popped up with big houses that were built with capital earned abroad. Some people return and then live on their earnings. Others build houses and then just visit for a few weeks each year. Some start building houses, but then don’t return leaving empty shells. Others simply don’t return. I’ve heard some really poigniant stories about the need to work abroad, but the longing to live in Poland. This might turn out to be the most compelling data I collect. Generally, the Bieszczady economy has shifted heavily toward tourism. Just about every other industry has disappeared, and farming was always marginal in the mountains and even less profitable now. Instead what has popped up is Agrotourism. In other words, people rent out rooms to tourists who want to spend some time in the country. I also read in the paper how land prices have skyrocketed in the more scenic areas higher in the mountains and by the lake. People who live in cities like Warsaw or even smaller ones earn so much more than rural folk that many have bought land and built holiday homes. Marysia and Ian are in Poland now, but before they departed we all participated in a Galbraith family reunion on Fishers Island, NY, during the first week of July. Fishers Island is near New London, CT, and, indeed, that’s where you catch the ferry to get there, but it’s actually an eastern continuation of the land mass that makes up Long Island. Marysia’s brother, Wiley, arranged for a pile of Galbraiths to stay at a 1920s vacation home near the beach. Of course, there are numerous photos from the gala event, but rather than tax the Internet with them I’ve selected the two that have received the most favorable comment. Our plane was delayed departing Birmingham because some doofus spilled fuel all over the wing. We were already on the plane when it happened, but we all had to get off and wait half an hour while they sopped it up. Ian was quite fascinated with the process. 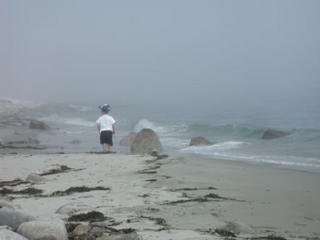 I had already left Fishers Island when Marysia snapped this evocative shot. My mom and dad liked it so much they had it enlarged and framed and gave it to my aunt Sally as a birthday gift. If only Life magazine were still around to publish it! They happened virtually simultaneously back in April. Marysia had to go out of town for a conference on 7 April [CORRECTION: Marysia reminds me that the date was 20 May] and was gone for three days. She figured that this would be a good time to wean Ian. He was definitely ready. Hardly made a peep about the missing breast milk. And after that weekend, he pretty much started sleeping through the night–from about 8:00 p.m. to about 6:00 a.m. There are still the occasional nights when he lets loose with a blood-curdling scream at 3:00 and there are still those times when he’s up for an hour in the middle of the night, but usually these night disturbances have a physical reason. His tummy is upset or he’s coming down with something. I guess it was just before his 20-month birthday that the change happened. I am so relieved that he finally reached this milestone. The disruption of sleep has been one of the toughest things about parenthood to deal with. In some respects, I feel like we’ve had insomnia for a year and a half. Another big change has been his move into an older kids room at the Children’s Discovery Center (as we reported in the 25 April 2005 blog entry). His new teacher is Ms. Miriam. And sometimes, for part of the day, he’s in with Ms. Leslie’s class. Even though he’s having a gas meeting all sorts of Polish kids, I’m sure Ian still misses his pals at the CDC! 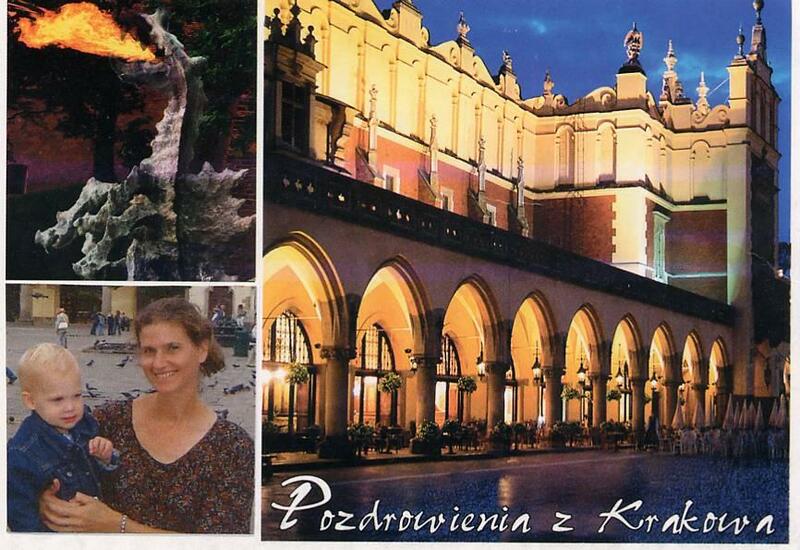 I just received my first postcard from Ian in Poland. Ian is talking more and more. Some new words include "eat," "outside" (side), "on" (which means both on and off), and "read." There is a new playground by Beata's [editor's note: Beata is a friend of Marysia's who's visited us in Alabama] Mom's apartment. Ian wanted to join the older kids on all of their play equipment. Everyone was very tolerant of him, making room for him and letting him explore. He had a whole cheering squad, too--me, Beata, her mom, and the son of a cousin. Ian took a liking to the cousin, who seems to be about 12, and Pawel was surprisingly receptive to Ian. He also took a liking to Beata's mom, and even went out with her when she went to pick up a few things at the store (one nice thing about Poland is that small shops are within a few feet of just about everywhere). He seems surprisingly able to communicate, even with people who don't speak his language. 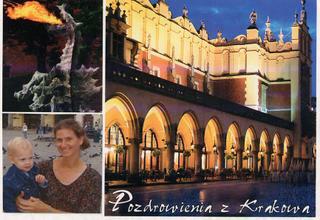 In a day or two, Ian and Marysia will be returning to Kraków. And apparently, Ian greatly enjoys all the trains, trams, buses and other forms of transportation in the big city. (Marysia hasn’t mentioned his response to the fire-breathing dragon.) It sounds like he’s having a blast! The plan is for me to go out there for Ian’s birthday, 27 September, and stay for a couple of weeks. I can’t wait!